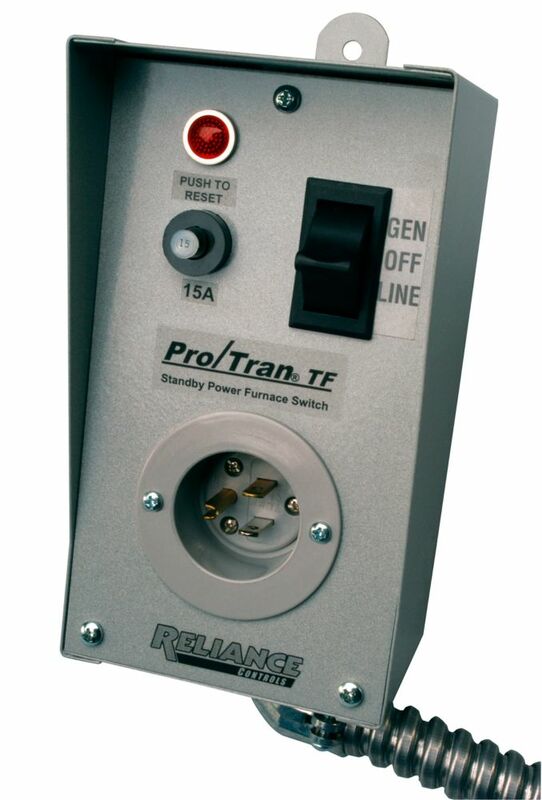 The Reliance Controls TF151W Transfer Switch is easy to install and easy to use. It is ideal for controlling a single 15 Amp circuit, such as a forced-air furnace using a grounded extension cord. The transfer switch ensures that you can safely use back up power during a power outage without having to worry about back feeding the utility line. In an emergency situation you might not think to shut off the main power source, the transfer switch makes it so you do not have to worry about that. The TF151W comes with an attached 18" flexible aluminum conduit for easy attachment to the circuit breaker panel or furnace or at any point in between. Power can be supplied from a portable generator, inverter, RV generator, fuel cell or any standby source capable of producing sufficient current. Leviton offers the most comprehensive line of durable combination devices on the market today. Combination devices permit installation of two devices in a space normally occupied by only one, resulting in reduced installation time and increased convenience. TF151W Transfer Switch for 15 amp Circuit with a Generator The Reliance Controls TF151W Transfer Switch is easy to install and easy to use. It is ideal for controlling a single 15 Amp circuit, such as a forced-air furnace using a grounded extension cord. The transfer switch ensures that you can safely use back up power during a power outage without having to worry about back feeding the utility line. In an emergency situation you might not think to shut off the main power source, the transfer switch makes it so you do not have to worry about that. The TF151W comes with an attached 18" flexible aluminum conduit for easy attachment to the circuit breaker panel or furnace or at any point in between. Power can be supplied from a portable generator, inverter, RV generator, fuel cell or any standby source capable of producing sufficient current. TF151W Transfer Switch for 15 amp Circuit with a Generator is rated 4.9 out of 5 by 45. Rated 5 out of 5 by JDJim from Switch is well made and easy to install. Works... Switch is well made and easy to install. Works as advertised. Rated 5 out of 5 by Michael from I replaced the NORMAL light switch that is next to my furnace with this So I can also turn the ci... I replaced the NORMAL light switch that is next to my furnace with this So I can also turn the circuit off from my panel and then have the option to change to Generator with this. Also the normal switch i had did not have a fuse.. This does. Rated 5 out of 5 by rushfan from Installed this in under an hour. Great instructions. Just had a cold spell of -20 deg F for four ... Installed this in under an hour. Great instructions. Just had a cold spell of -20 deg F for four days. Fortunately didn't lose power. But I was ready! Rated 5 out of 5 by TomR from As advertised and easy to install. Tested and unit worked... As advertised and easy to install. Tested and unit worked with no problems. Depending on where your generator is located, the switch can be placed at the main breaker, furnace, or anywhere in between. Rated 5 out of 5 by Gabe from Worked as expected, easy to install.... Worked as expected, easy to install. Rated 5 out of 5 by Burd from This product worked as advertised. It is a... This product worked as advertised. It is a very good and simple way to prepare for a power outage so that the furnace...or any other circuit can be powered by a generator without going through the big expense of powering the whole house when just essential circuits are needed. Rated 5 out of 5 by Keith from Very easy to install.... Very easy to install.